only a step or two away from the Louvre Lens Museum. A great deal of thought went into chosing the works of Art which decorate the Esprit de France hotels. The original paintings are carefully selected by a knowledgeable collector to compose ensembles specific to each hotel in coherence with the rest of our collection. 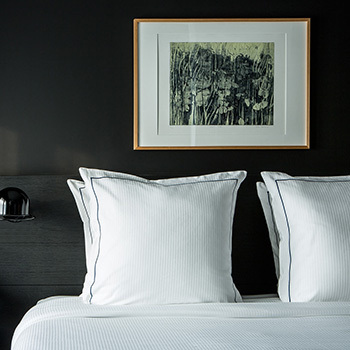 At the Hôtel Louvre-Lens Thibaut Cuisset’s photographic scenery opens windows in the public areas and Sylvie Abélanet’s engravings offer guests escapism in the bedrooms. 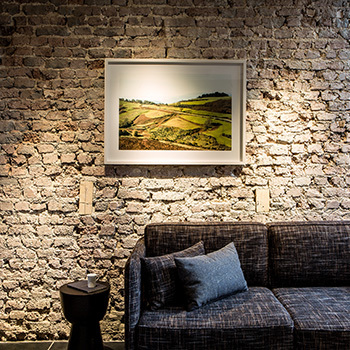 The internationally reputed, classically-trained artists’ photographic work is perfectly in-line with Esprit de France’s standards and aim to gradually add to the collection over time. In addition to the hotel’s private collection, we have a special partnership with our neighbour Louvre-Lens museum and other institutions such as the CRP (Centre de Photographie Régional des Hauts-de-France – regional photographic art centre). These partnerships bring about the exhibitions which are held in the public sections of the hotel.